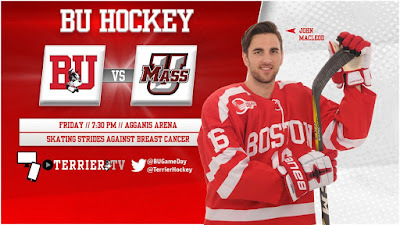 A week after defeating UMass, 3-2, in Amherst, BU will host the Minutemen at Agganis Arena tonight with puck drop set for 7:30 p.m. Since then, the Terriers defeated Harvard in the Beanpot opener, while UMass dropped a 3-1 decision to New Hampshire and defeated Merrimack, 5-2, on Tuesday. Tonight's game will be live-streamed on ESPN3. Against the Warriors, UMass tallied two power play goals and also received a pair of even-strength scores from John Leonard. Goalie Matt Murray stopped 31 of 33 shots. BU will be without Jordan Greenway tonight and for the remainder of the regular season as he had departed for the Winter Olympics. The Boston Hockey Blog tweeted that Chad Krys--out since the Arizona State series--and Bobo Carpenter, who was shaken up in Monday's Beanpot game, skated in practice on Thursday. Patrick Harper did not participate. NHL.com talked with Ty Amonte about his game-winner in the Beanpot semifinal and upcoming games (video). 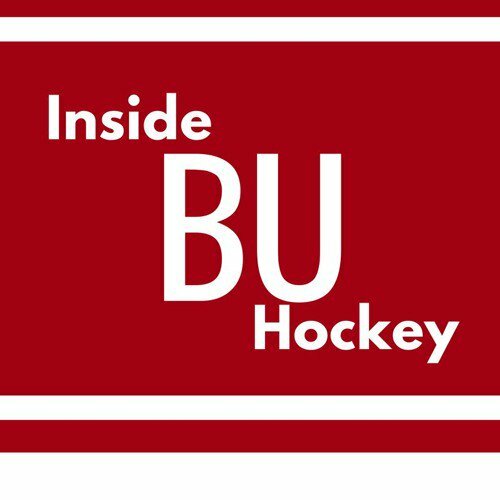 ►This week’s episode of Inside BU Hockey features Bernie Corbett’s interviews with Coach David Quinn, senior Chase Phelps and former BU All-American, U.S. Olympian and two- time Stanley Cup champion Shawn McEachern. Phelps, who played at Shattuck Saint Mary’s Prep with Greenway, has 14 points as a Terrier playing primarily on BU’s checking line. McEachern, who was inducted into the Beanpot Hall of Fame last Monday, scored 186 points in three seasons as a Terrier, good for sixth on the all-time list. His 82 points in 1990-91— second best in BU history—led the Terriers to the NCAA championship game. He scored the game-winning goal in the Hockey East Championship Tournament that season. 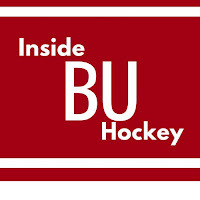 ► BU Today features the Terrier men and women who will be skating in the PyeongChang Winter Olympic games. ►This week’s Hockey on Campus podcast features: Denver Coach Jim Montgomery, Northeastern forward Adam Gaudette and Shane Frederik of the Mankato Free Press. Hockey on Campus airs on NHL Radio (SiriusXMChannel 91) on Saturday morning at 8 a.m. ET and Sunday morning at 10 a.m. ET. You can also find it here on College Hockey News. Buffalo Coach Phil Housley, looking to ramp up his team’s offense, moved winger Evan Rodrigues onto Jack Eichel’s line, reuniting the linemates from BU’s 2014-15 Frozen Four season. It worked like a charm to produce a 4-3 win over the Islanders. Eichel scored on the Sabre’s first shot, ERod made it 2-0 on their second shot and, after the Isles tied the score at 3-3, the former Terriers assisted on the game-winning power play goal. Clayton Keller’s 15th goal was the overtime winner as the Coyotes rallied from a 3-0 deficit to defeat Minnesota, 4-3. ►Boston Hockey Blog: Last year's Terriers--Where are they now?